Thank you for your interest in the Great Falls Volunteer Fire Department. We have proudly served the surrounding community since 1942 as a functioning enterprise that is very involved in community service, safety, prevention, and response. We are currently seeking dedicated individuals who are willing to devote their time and talents to our organization. Great Falls Volunteer Fire Department is one of twelve active volunteer departments within Fairfax County's Fire and Rescue Department, a combined system of both volunteer and career members providing 24-hour coverage to each of the county's fire stations. We are currently looking for Operational volunteers. The two types of Operational members are EMS-only or EMT/Firefighter. Serving as a volunteer firefighter or emergency medical technician (EMT) is a very demanding, yet very rewarding experience. You will be able to serve your community and help others most in need. Administrative members provide the necessary support for operational members to complete their duties as EMS providers and firefighters. If you are considering this challenge, you should expect to devote a considerable amount of your personal time for at least the next two years to make it worthwhile. be able to pass a background investigation. fulfill administrative work, as required. 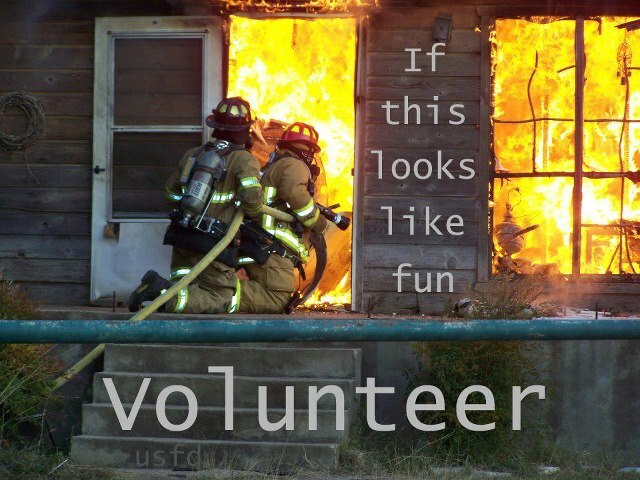 Becoming a volunteer is both rewarding and demanding and requires a major time commitment, especially during training. Members are required to take various mandatory training classes that include both evening and weekend hours, attend monthly membership meetings, help with various station events and drills, be in good physical condition, and participate at least 20 hours a month in department-related activities. However, the rewards are numerous. In addition to County insurance coverage and exemption for one vehicle for the Personal Property tax, the benefits of knowing that you have served your community and made a difference in others lives is rewarding. If your job or school will not permit you to devote the required time and effort to this endeavor now, you may want to consider applying at a later time. Because of our investment in time and taxpayer's money, we are looking for a minimum 2-year commitment from our members. Most stay longer. Volunteers are required to ride (act in a support role to career staff on apparatus) at least 20 hours per month and attend monthly drills. There are additional continuing education requirements for each certification (EMT, paramedic, etc.). All members are required to attend monthly meetings on the first Monday of each month. Volunteers provide EMS coverage to many County events, including the Fairfax Fair, Bull Run Jamboree, Herndon Festival, and Wolf Trap events. You will be called upon to participate during these activities. Your participation counts towards your 20 monthly hours. After the initial interview is completed, the interview paperwork is sent to the County for a background check, which may take between four and six weeks. Upon approval by the Fairfax County background investigator, applicants are invited to attend our next monthly meeting where you will be voted in for probationary member status. Probation lasts for one year. Once you are voted in as a probationary member you will be asked to set up an appointment at the Occupational Health Center (OHC) as soon as possible for a physical. The results of this physical are required for all Operational members. 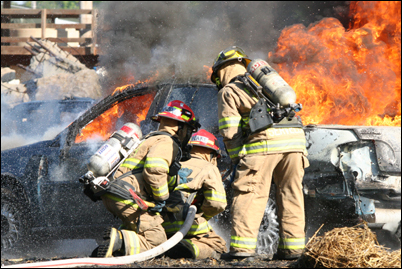 EMTs and firefighters engage in physically challenging work that requires that you to be in reasonably good shape. It is highly recommended that volunteers embark on a physical conditioning regime prior to entering the Fire Academy. This will not only help ensure your successful completion of the training, but will allow you to enjoy the education process more. You will be provided with the highest caliber of training. Fairfax County's Fire and Rescue Academy is known as one of the top training facilities of its kind in the country. Instructors complete a rigorous training program and bring years of experience to the classroom and practical activities. All volunteers receive the same level of training as their career counterparts. Probationary members will first complete 20 hours of in-station (VISIT) training, consisting of familiarization with the station, equipment, apparatus, and procedures. There is a written and practical exam at the end of VISIT training. At that time, members are encouraged to purchase the standard uniform since this is the preferred dress code for Academy classes. The uniform consists of navy blue pants, steel-toe boots, and a station polo shirt. All shirts are provided by the department. The next training course, Level 1A and 1B, is held at the Fire and Rescue Academy every other month. Topics covered in this course include CPR, HAZMAT awareness, blood-borne pathogens, personal safety, and communications (a total of eight classes). Administrative members only need to complete training through Level 1A. Level 1 training usually takes about three weeks to complete. Operational members are also required to pass the comprehensive Fairfax County medical examination prior to riding or further training past Level 1. Once you have passed the physical, you will be able to obtain your turnout gear and ride as a Red Hat. Upon completion of the county physical, VISIT training, and Level 1 course, you will then go on to EMT-B classes. These usually last approximately 4 months, with classes held twice a week in the evening and one weekend day. For EMS-only volunteers, no further training is required. If you already have EMT certification (approved by Fairfax County and the Commonwealth of Virginia) you will still be required to attend several classes on Fairfax County-specific subjects at the Academy. For those wishing to become firefighters, there is a 5 month course that must be taken. This class is approximately 320 hours and meets twice a week in the evenings and on both weekend days. Completion of EMT-B, EVOC-2, and FF II qualifies a volunteer to be considered minimum staffing. Minimum staffing personnel are qualified to fill in for career staff when needed. Once you complete FF II, or EMT-B for EMS-only volunteers, you will need to successfully complete EVOC. Upon successful demonstration of your skills and abilities you will then be permitted to drive an ambulance on emergency calls. Probationary members are issued a Station 12 uniform polo shirt and T-shirt. You will be responsible for buying blue work pants and a pair of steel-toed black boots or work shoes. The County will provide you with all necessary Personal Protective Equipment.